Angry Boys DVD Review. But at the end of the day Angry Boys is far from fresh, and far from his best work. The brainchild of Australian comic Chris Lilley, whose previous creations include the mockumentary series’ We Can Be Heroes and Summer Heights High, Angry Boys was eagerly anticipated and saw the talented Lilley building on his previous successes by teaming up with US cable giant HBO, who acted as co-producers. Which is why it’s perhaps surprising that Angry Boys looks so similar to Lilley’s previous, presumably more modestly budgeted jaunts (Tokyo footage notwithstanding). The mockumentary guise is once more adopted, the characters mostly swiped wholesale from his former work (brothers Daniel and Nathan Sims, who were both funnier and more sympathetic in Heroes) or loose reworkings of the same basic premise (blackface youth, stereotypical Asian, etc). The title sequence even favours the same chirpy youth choir refrains - I’m all for stylistic consistency, but too often in Angry Boys this familiarity and Lilley’s unceasing penchant for borrowing old gags lends the whole thing a somewhat stagnant air, which certainly isn’t a criticism that could have been levelled at the convention-defying comedian in the past. The premise this time around is somewhat tenuous - most episodes open on the Sims farm, and as the series progresses we are introduced to ‘S.Mouse - the boys’ favourite rapper,’ ‘the boys’ favourite skateboarder’ and the like. Rounding out the sextet of Lilley creations this time around are Gran, a lovable but firm juvenile detention warden with a penchant for political incorrectness, Blake, a washed up surfer firmly in the Bra Boy mould, and Jen, the overbearing and seemingly unhinged Japanese mother of Tim Okazaki, the aforementioned skateboarder. 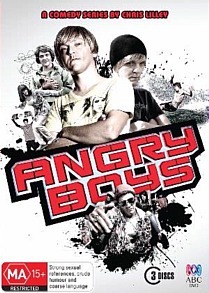 If you’ve seen any of its predecessors you’ll know what to expect of Angry Boys ­- the machinations and mishaps of a bunch of flawed, occasionally grotesque but not wholly unlikeable misfits. The humour isn’t subtle - two of S.Mouse’s hits are titled ‘Poo On You’ and ‘Grandmother Fucker,’ to give some indication - but that and the frequent attempts to shock hardly come as a surprise at this point. What does come as a surprise is how great the lull between laughs is. On Summer Heights High they came thick and fast as viewers revelled in the madcap spoutings of quotable fan favourites like Ja’ime and Mr G, but here only some of Gran’s more startling utterances (as when she refers to a black youth as ‘Coco Pop’) or Jen’s wilder flights of stage mom fancy can rescue the series from its ‘been there, done that’ torpor. The three disc set contains some excellent bonus features, principal amongst which are several dozen deleted scenes and outtakes from all six main characters, and fans of Lilley’s will find much to recommend it. But at the end of the day Angry Boys is far from fresh, and far from his best work.